Women Institute of Technology (WIT), Dehradun has released advertisement for the recruitment of Professor/Associate Professor/Assistant Professor and Librarian in various disciplines. Total No. of Post is 18. The candidates are required to apply in prescribed format and send the same by speed/registered post. The application complete in all respect shall reach to the Director of the Institute latest by 06 Feb 2019. Consultancy and other methods of fundraising for the Institute shall be preferred. Ph.D. degree from the reputed university. Participation in professional society activities; and organization of conferences and seminars. Age <35 years on the last date of receiving the application. Publications record in refereed scientific/ professional journals. Age <35 years on the last date of receiving the application. The age may be relaxed by director with the permission of Board for deserving candidates. Teaching/Research/Industrial experience in reputed organization. Age < 45 years on the last date of receiving the application. Knowledge of computers, internet and other recent advances in library operation and management. Selection of the candidates will be based on their academic records and Interview Marks. Latest by 06-02-2019 (04:30 PM) by Registered/Speed Post or Submit by Hand. Candidate must write Department and post applied for on top of the envelope. 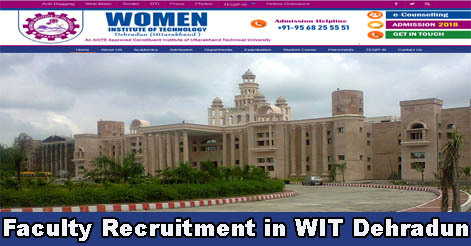 Help us to improve this article/job posting "Faculty & Librarian Recruitment in WIT Dehradun". We would be glad if you can comment below and provide your valuable suggestions and feedback. If this page have any wrong information/list or out of context content, then you can report us as well. I have done the Master of library and informtion science (MLIS). I Have an experiences of 15 years in Heading the Library in schools. Can I apply for the Librarian post in your prestigious institutions. I am pursuing B.LIB.can i apply for the librarian post in your institutions.